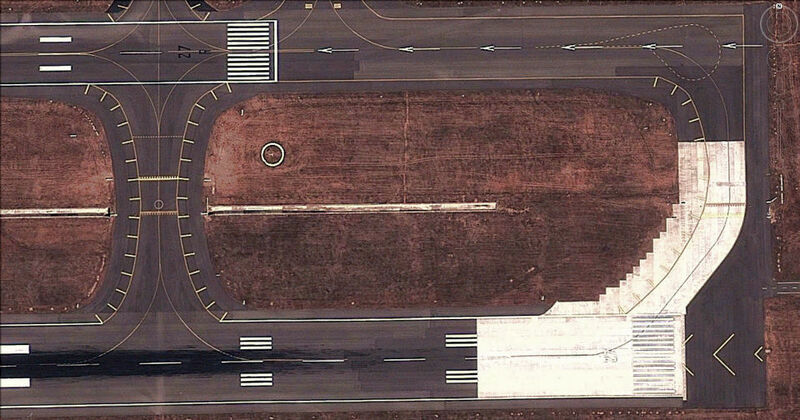 Google Map Image of VOHS, with the parallel taxiway now serving as a parallel runway just once a week. It is weird when a flight crew member calls you up and asks, “Did you know that Hyderabad has a parallel runway?” Well, being off the line for some time can have its effects. The GMR-Group’s Ragiv Gandhi International Airport (RGIA, ICAO: VOHS) at Hyderabad proudly boasts off as ” the first greenfield airport in the region with two runways”. While that is true, a closer look reveals what it really is. The AIP Supplement AAI/ATM/AIS/09-09/201 (click to view) from the Airport Authority of India, effective 09th February 2012 (a month back) details that the parallel taxiway-“A”- has been converted to runway 09L-27R for day VFR operations and the current main runway is re-designated as 09R-27L. The new runway is 3707 meters long (in comparison to the 4260 meter long 09R-27L), and is 145 feet wide (in comparison to 195 feet of the main runway) and is certified for operations by Code-E aircraft. Code E includes aircraft such as the A340 and B747, and is defined by wingspan between 52m & less than 65m, and the outer main gear wheel span between 9m & less than 14m. The new secondary RWY shall be a dependant RWY (operating with restrictions), and available only for day operations in visual flight rules. No precision approaches (ILS) are available. At a time, either RWY 09L-27R (new runway) or RWY 09R-27L (old runway) shall be used for the purpose of landing and take- off, but both may not be operational at any point of time. The distance between the centrelines of both parallel runways is just 224 meters (736ft), and cannot support parallel runway operations. The main purpose of opening the new runway was to prevent disruptions in flight operations during scheduled maintenance. Every Tuesday between 1330-1530 hrs local the main runway (09R/27L) is closed for maintenance work. RGIA can continue flight operations uninterrupted during this period. Also, in the event of a mishap closing one runway, the other runway may remain operational to prevent a disruption in flight schedules. Sir iam studying B-Tech in civil engineering. I listen that the efficiency of shamshabad airport runway is acquired upto 85percent so that we want to design a new runway. Iam intresting to do this as my project. So kindly inform the details about this serious and intersting issue. Contact me in my mail or my mobile 8686515195 as siva. Sir iam studying B-Tech in civil engineering. I listen that the efficiency of shamshabad airport runway is acquired upto 85percent so that we want to design a new runway. Iam intresting to do this as my project. So kindly inform the details about this serious and intersting issue as early as possible. Contact me in my mail or my mobile 8686515195 as siva.